I am very happy with his face. A lot of touch ups will be done, but in general he turned out to look like I wanted him to look. 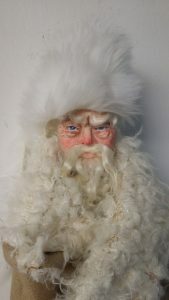 And, yes, Grandfather Frost always has red nose. Why? It is cold there, in his Kingdom! ← Are Santa Claus and Grandfather Frost the same?